My question is long so it won't fit here so look at the comment of this question? I'm starting to lose weight but what motivates me to doing it. Is by thinking of a reason of what gives me doubt and it makes it easier of avoiding sugar and eating healthy but if I do eat sugar or something sweet I lose that motivation it feels like it's in my stomach and it feels like a dark doubt. But I of course love it since it's helping me lose weight easier but can you tell me what that is and called. Also, is there any side effects if I continue to lose weight with it? You are negatively programming yourself to not eat sugar rather than positively encouraging yourself to be healthier in your food choices, the messages you give yourself affect your mood and your body. Losing weight doesn't mean depriving yourself of little amounts of what you enjoy, it means maintaining a balance. If you treat yourself in this way you are in essense bullying yourself and no one likes to be bullied. I guess your are feeling this doom and gloom programming in your gut. If you are in the search for knowing where are saved documents my computer windows 10 so here you will be able to know all those ways by which you can easily access over it and can increase your knowledge. https://sillyphotographer.wordpress.com/ I love photography so i created this blog. It has all of my clicks. Please take a look at it and please share your comments here? I have a question to ask, but it won't fit here. It regards something strange my little brother did, and I need to know what was happening. My actual question is in the answers? My online skype is broken. I have contact with some of my best friends on here, so I'm really upset. 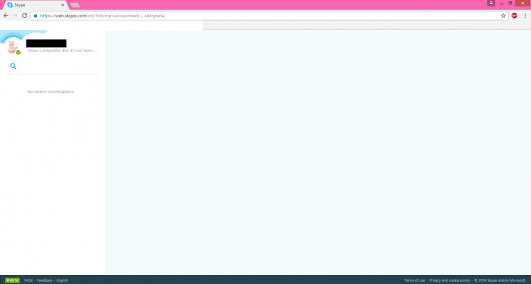 Okay, so, I've tried reloading the page, exiting and re-entering the tab, went into my task manager, shut it down, and re-loaded it, and basically everything except restarting the computer. And anytime I try to look up the contacts names in the search bar under my profile pic, it doesn't click into it. Another problem is the "skypecall" extension won't load. I've completely given up on the extension at this point. Should I restart the computer, or is there another way? I have a long question which really impacts my life but it wont fit in 250 charaters, so.. yes or no, whichever gets more i will do?